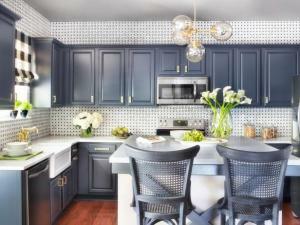 Nothing gets homeowners in a better mood than the opportunity for a kitchen makeover. This room is the ultimate space for renovations and remodels, perhaps due to the endless redesign options. Moreover, the transformative power and potential of remodeling your Cleveland kitchen increases equity and enhances your home’s aesthetic appeal. That is, of course, if you know what you are doing and do not end up falling victim to the all-too-common trials and tribulations of kitchen makeovers like so many of your fellow homeowners. Our kitchen design tips will ensure your cooking space is full of life and a place that you will be happy to call home. Avoid the humdrum and the ordinary, and never be afraid to think outside of the box. Have a general idea of what you are looking for, but remain open-minded about the possibilities. Aim to incorporate, at the bare minimum, one design element that is super creative and inspiring. It does not have to be over the top or expensive by any means, but something new, fresh and trendy always leaves a good, lasting impression. Update the cabinetry so that it meets the ceiling. These designs not only look better, but they also perform better from a functional aspect since they free up cabinet-counter space. You also need not worry about dust collecting on top of them! While minimalism is discouraged, doing too much can be just as disastrous from a design standpoint. You should always have a limit concerning how much you want to do because excess tends to come off as gaudy and crowded. Breathing room is one more kitchen design tip we would like to stress. A healthy room layout includes enough floor space and area between countertops and any islands. Additionally, we advise our customers to buy sturdy, durable cabinetry, install countertops around wall ovens, and last but not least, to have fun in the process. Do not take your kitchen remodel too seriously – it is supposed to be an enjoyable experience!